I make picture books since I love making various items by myself. Children can easily hold small books, and adults get a fresh impression from mini-books. I found FUKUKITARU was good for storing them. The tiny barrel may mature the handmade books and their innermost thoughts. I hope you feel relieved when you pick out the books and read them. There are signs of fall in the air in the morning and evening. It's the best season to drink hot chocolate. I bought chocolate powder for hot chocolate at a chocolate shop in Spain the other day. 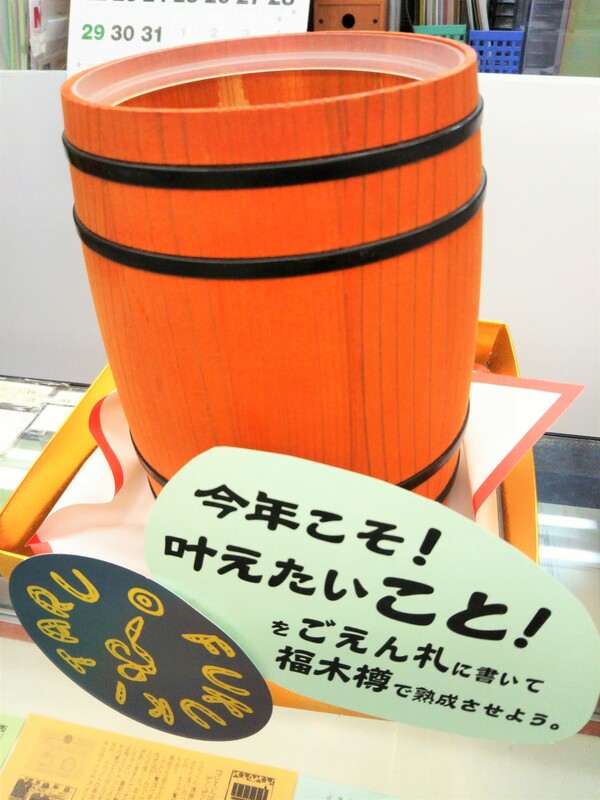 When I put it into FUKUKITARU, I felt a good combination of two(chocolate and a tiny barrel). The chocolate has been kept in FUKUKITARU since then. I'll enjoy this chocolate in relaxing time while the chocolate is being matured in FUKUKITARU. I've visited the hedgehog cafe "HARRY" in Harajuku. Because the cafe uses FUKUKITARU as hedgehogs' rooms. You can see hedgehogs are sleeping comfortably in their favorite FUKUKITARU at the cafe. I could touch and hold them when they woke up. And I felt they're gentle and soft. They were so cute that I wanted to bring them home. I heard a hedgehog was a symbol of happiness in Europe. Therefore hedgehogs and FUKUKITARU are good match. I've found the practical use of FUKUKITARU as a name card container for the guests who had come to the events. 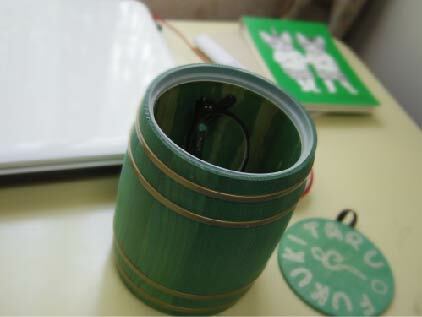 Once you put your name card into the tiny barrel, you can't see the surface of it easily. And moreover the name of "FUKUKITARU" sounds lucky. FUKUKITARU may mature the relationship among the guests who put their name cards. Then the relationship may bring better solutions. They say "Plans for the year should be made on New Year's Day". Did you plan anything or make a wish? I had a chance to make plans for this year at the seal shop "Enenlink Katachiyaten". 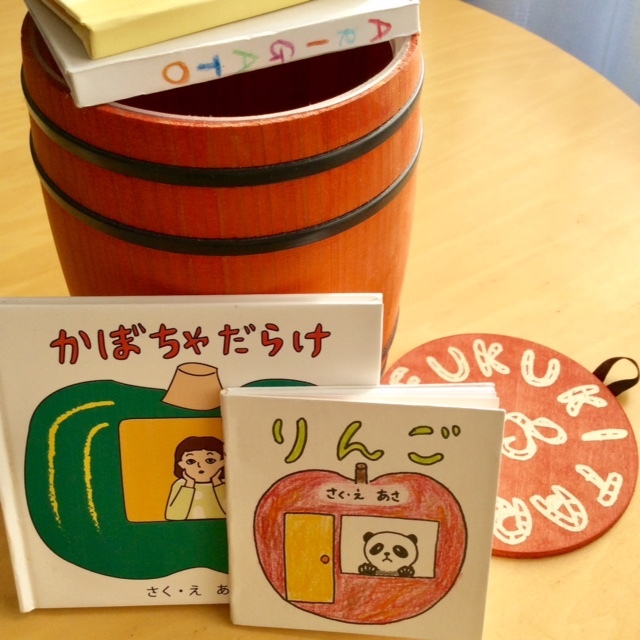 I and other guests wrote our plans or wishes on the cards, and put them into FUKUKITARU. All of us were deep in thought about what to write, and we enjoyed the event. May our wishes be matured and come true! ...when we'll open the cosmos"FUKUKITARU" a year after. I love "gari" which means sweet-vinegared gingers. How about you? They're good as garnish for SUSHI and grilled fish. Recently I was given a lot of newly harvested gingers, and pickled them. I often give close relatives some of the bottles I stuff with homemade preserved food. Sweet-vinegared gingers in FUKUKITARU may be unexpected small gifts. I had a trip to Hokkaido and bought sweets as souvenir. Among a lot of kinds of Hokkaido sweets, I recommend two "corn sweets". 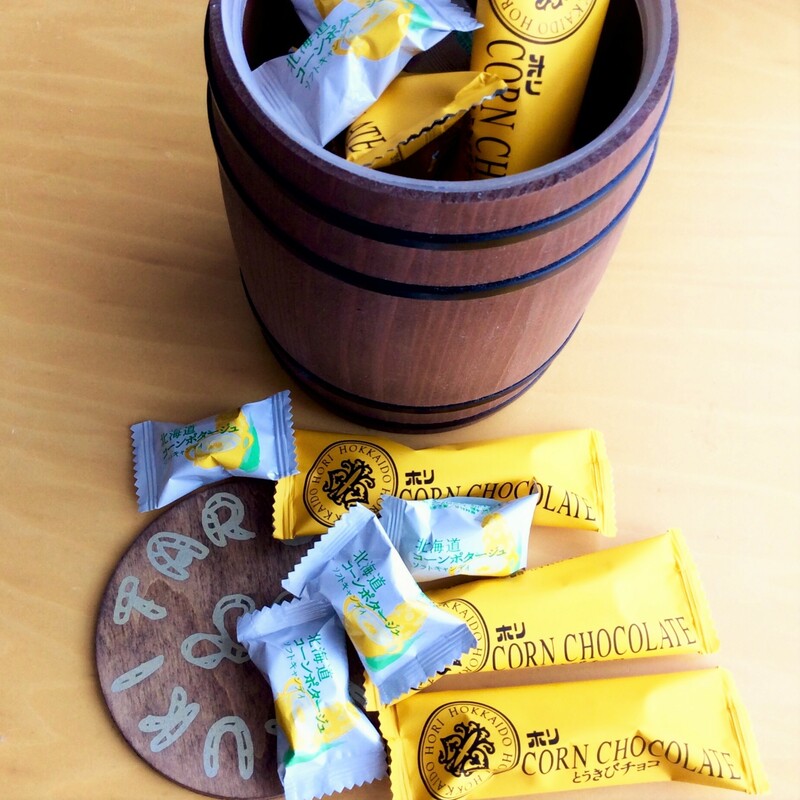 The one is a traditional "corn chocolate", the other is an innovative "corn potage candy". Both of them make me feel flavor of corns which are well-known products of Hokkaido. You'll be relieved to eat chocolates after enjoying candies of adventure. Why don't we take a tea break with various sweets in FUKUKITARU ? I have been feeling great interest in Spanish foods lately... paella, gazpacho, ajillo, tortilla, and so on. I made churros which are Spanish doughnuts for the first time. They taste good though they look like just fried dough sticks. And stick sweets and FUKUKITARU match well. I'll try making "churros" again and putting them into FUKUKITARU. It is good for health to take a bath in hot summer. You'll feel good, having a hot bath after a cool wind attack of an air conditioner. And you can be relaxed with your favorite bath goods(shower gel, bath salt, bath sponge and so on). Also, going to Sento(Public Bath) is much fun for me. 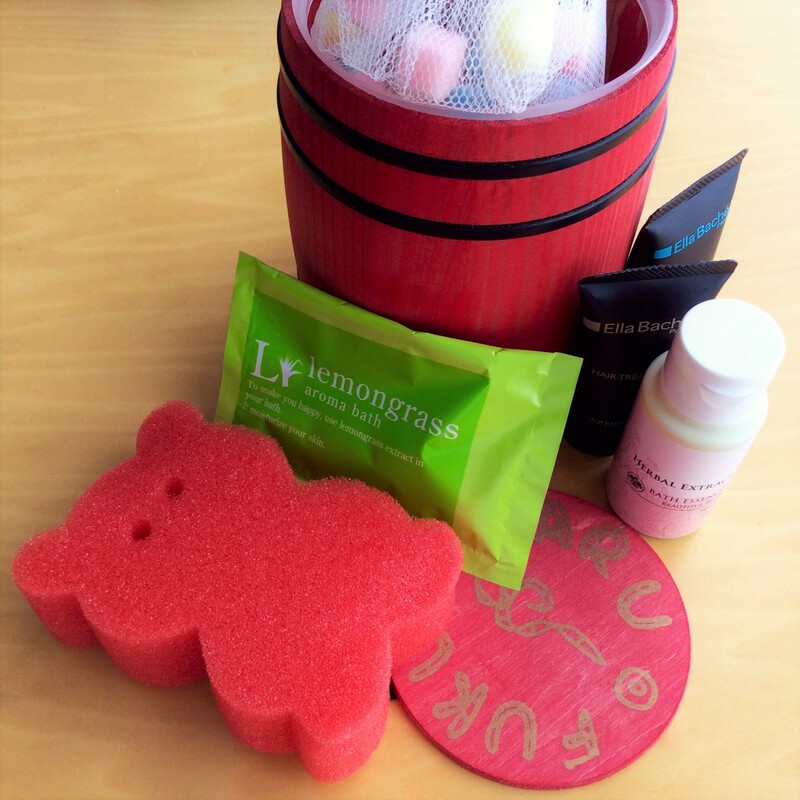 Let's enjoy bath time in various ways with FUKUKITARU which is full of your bath goods. I've been a lover of socks for long. Needless to say a lot of designs, their materials are various and their textures are thin or thick. It's so fun to choose socks which match the clothes and shoes. It may be a good idea to gift socks in FUKUKITARU which keeps three thin socks or two thick socks. A lot of handkerchiefs in a drawer. I am relieved to carry one or two of them, because they're so convenient to dry my hands and wipe my tears and tie up lunch boxes. You can use them to keep away from smoke in a fire and stop bleeding in an emergency. 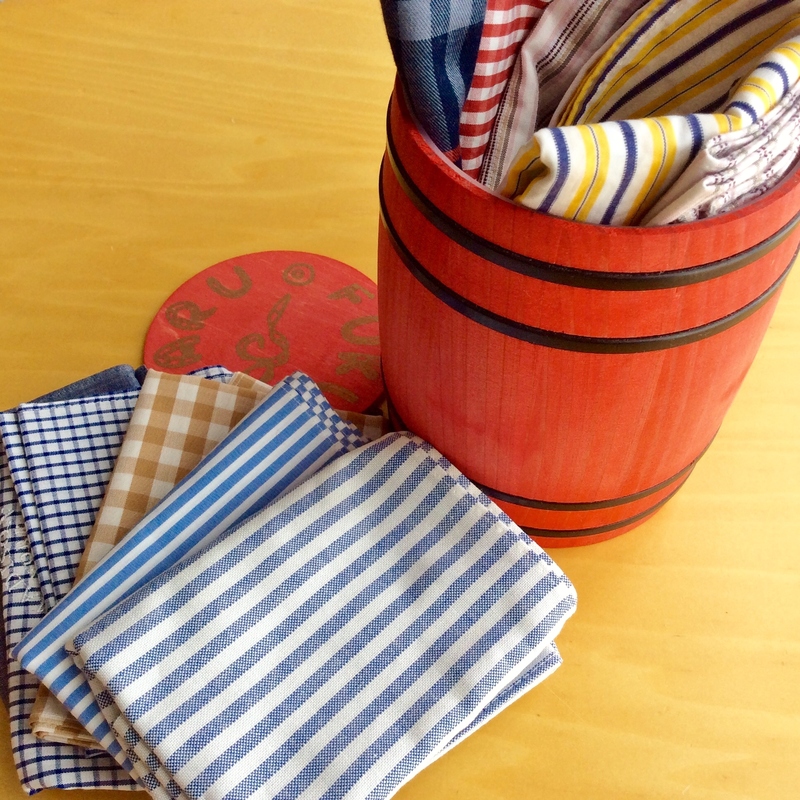 I put my favorite handkerchiefs in FUKUKITARU for a change. I enjoy a cup of coffee for a break. It's convenient to use packaged coffee beans for one cup. You can choose various kinds of blended coffee...mocha, Kilimanjaro, the original blend of the coffee shop and so on. How about filling FUKUKITARU with your favorite packaged coffee beans for a precious time? Kanbutsu means dry foods groceries which include dried strips of radish, dried sea weed, beans, dried bonito and so on. Needless to say the well-condensed taste of dry foods, I enjoy seeing how they absorb water. They seem living things. Dry foods groceries can be stored for a long time, and they're convenient for emergency use. Shall we keep them in FUKUKITARU for an enjoyable storage? I enjoy various kinds of candies after meals. My favorite flavor is "mitarashi" which tastes sugared soy sauce like "mitarashi dango (dumplings)". How many candies do you have in FUKUKITARU? About 50 pieces which is 250 gram in weight. You find FUKUKITARU useful as a candy box for a Whiteday's gift. Once women gifted chocolates to only men on St.Valentine's Day in Japan. The style of this event has changed recently. The new trend is "Friends' Chocolates" which means chocolates women gift each other. Women are happy with the sweets as an expression of a friendship. May their hearts be ripe when they put chocolates in FUKUKITARU. Soybeans and beet sugar are grown in Hokkaido. 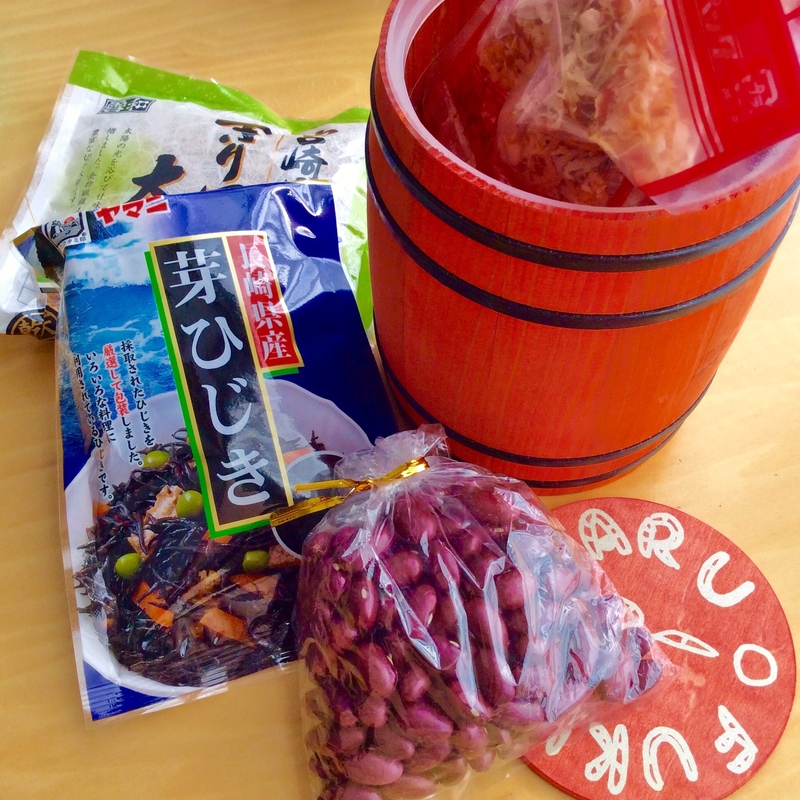 The simple sweets in Asahikawa which are named "Asahimame" are made from these two ingredients. The light sweetness of covering beet sugar doesn't conceal a delicate flavor of beans. A new year will come soon. We make a big purchase at grocery stores in December. How about CupNoodles for the time when you are fed up with Osechi which means celebration dishes of the new year? They are convenient foods for storage. These days you can find the noodle refills considering ecology. I put the noodle refills in FUKUKITARU wishing a happy new year. I was not born in Osaka, and still I love Osaka because I've lived there for a long time. People in Osaka enjoy various kinds of good snacks. A friend of mine who was from Osaka introduced me one of snacks when I was a university student. It is "Onigiri Senbei" which is tiny and simple rice cracker, and popular in Osaka(Kansai area). 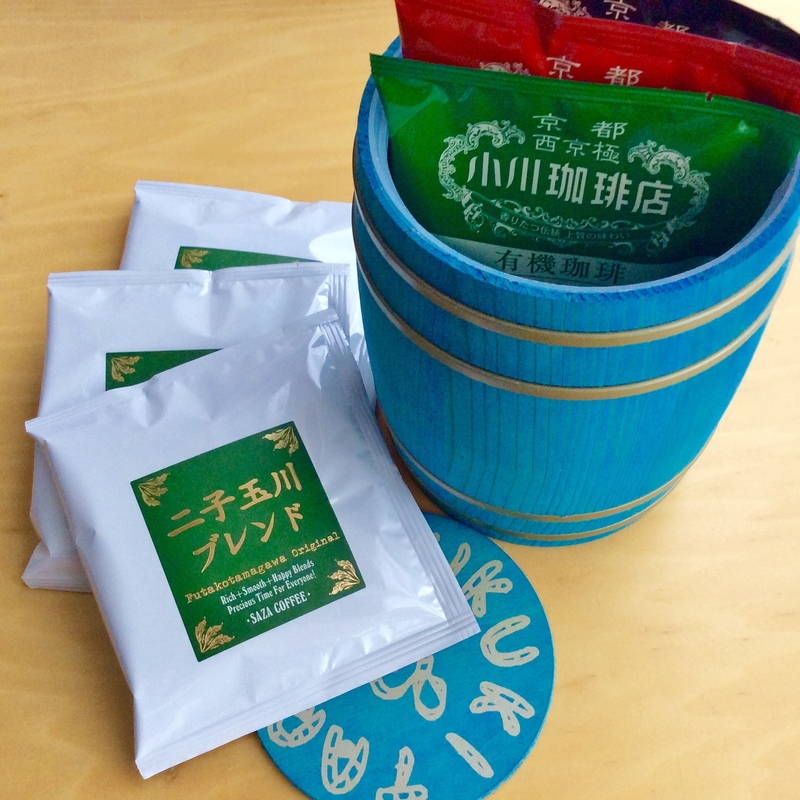 Shall we keep mini packaged "Onigiri Senbei" in FUKUKITARU until a tea break? You can see various Halloween goods and decorations everywhere though the date of Halloween is about a month later. In the U.S.A. Halloween is an originally celebration of harvest and the expulsion of dead souls. But in Japan it seems to be a festival people dress up as ghosts and scary things. Let's prepare candies and sweets in FUKUKITARU for the time children come saying "Trick or treat!" The folding umbrella is convenient in unsettled weather. The ordinary umbrellas are put in an umbrella stand. On the other hand, where do you put the folding umbrellas? The folding umbrellas in FUKUKITARU look smart in the entrance. Do you need milk and sugar for coffee? I need neither of them. But it seems that they were used popularly when Japanese started taking coffee habitually. Even now several old coffee shops serve coffee and milk, coffee and sugar. 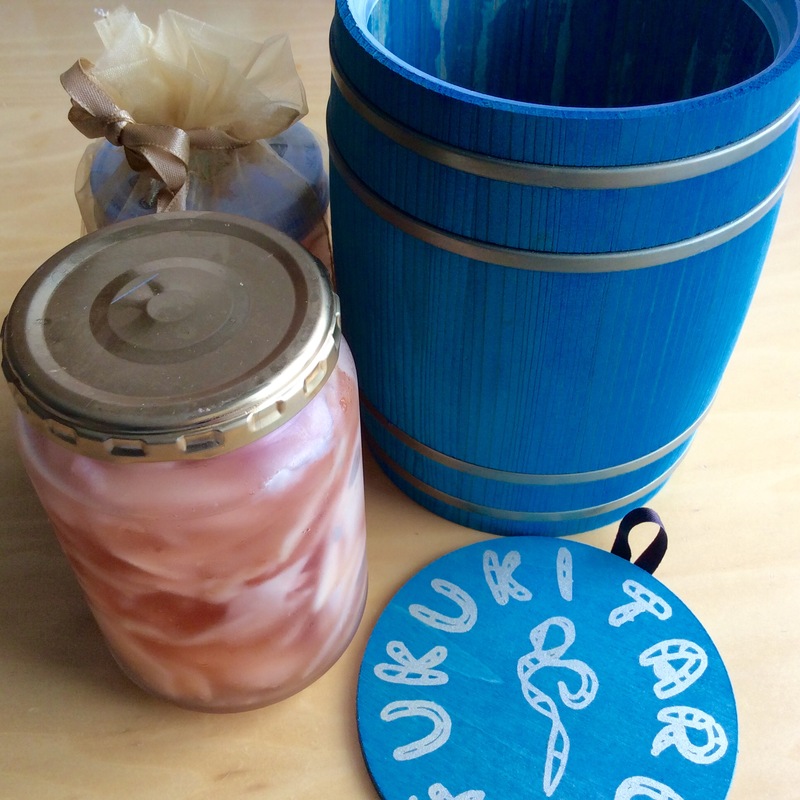 I used FUKUKITARU for keeping milk and sugar when I joined a small event recently. I'm having practice in brewing coffee for a small event. The taste changes with how to grind beans and how to pour hot water. But my teacher of barista says the heart is prior to technique for brewing good coffee. I put the paper filters in FUKUKITARU with a wish that I can make good coffee with a smile. "I, one of women, will wear ties as men do." Various unisex ties please me in spite of Cool Biz program. A lot of ties are designed and colored for women these days. It's too good for only men to wear ties! Rolling up my favorite ties and keeping them in FUKUKITARU as they won't be crumpled. Japanese products attract people these days. But the high quality of Japanese products may become clear by long use with love. A natural indigo dyed towel made from 100% organic cotton and made in Japan with FUKUKITARU(made in Japan, of course!) for a small gift. Let me introduce to you "a forest railway". Once the train carried not only logs cut down in the forest but also people who lived in the mountain. It has gotten out of use because of development of roads and trucks. The forest train in the railway model world has just started from FUKUKITARU for loading logs. But it's too difficult for me to make good coffee. I know a barista who brew best coffee I've ever drunk. He is a master of my favorite cafe. The interior of the cafe decorated with folk art furniture, and beautiful coffee cups also make me feel coffee better. Coffee beans the master recommends with FUKUKITARU. They look good for gifts to someone who likes coffee. The aroma of flowers and plants surely have the power which remedies one's heart. When I was disappointed in love in school days, one of my friends came home with a big bunch of flowers. Not mention to her friendship, the sweet aroma of flowers relieved me from sorrow. whose beautiful color (Turquoise Blue) makes me calm. whose wooden roundness is a joy to the eyes. 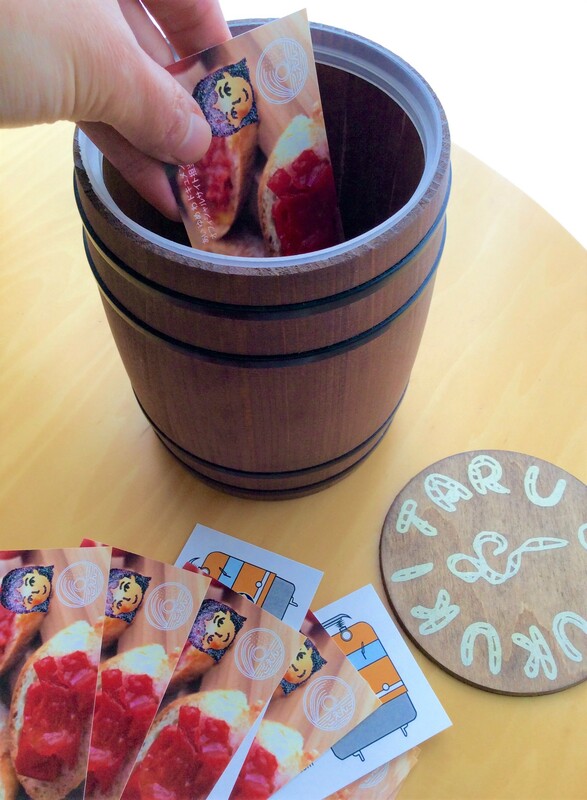 With FUKUKITARU - literally a "Barrel Full of Happiness" - your only limit is your imagination. I have stuffed my favorite sweets(fruit jelly) into it. Copyright(c) SHOTENGEKIJO CORPORATION All rights reserved.